PHOENIX--(BUSINESS WIRE)--Avnet (Nasdaq: AVT), a leading global technology solutions provider, today introduced the Avnet Network FMC Module, offering designers of emerging industrial Internet of Things (IoT) applications industry-leading Gigabit Ethernet switching at less than half the cost of devices currently available on the market. Optimized for Xilinx FPGA and SoC-based industrial Ethernet digital communications systems, the new Dual 1000 Mbps Networking FMC Module supports applications such as cloud-based data centers and industrial automation. Now available to customers in the Americas, EMEA, Asia and Japan, the Network FMC module (AES-FMC-NETW1-G) is priced at $149. For more information, visit http://avnet.me/fmc-network1. Reference designs using the recommended equipment can be found on the Reference Design Page for the UltraZed-EG + PCIe Carrier Card. Additional reference material is available on the Network FMC accessory page, http://avnet.me/fmc-network1-doc. 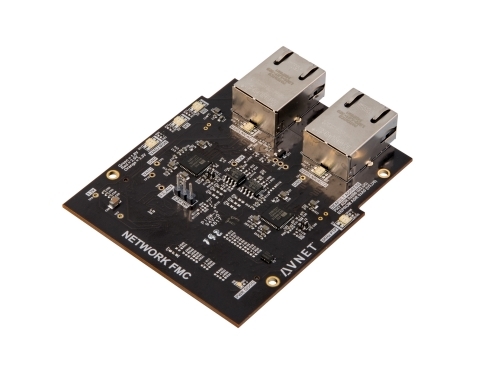 Avnet introduced the Avnet Network FMC Module, offering designers of emerging industrial IoT applications industry-leading Gigabit Ethernet switching.